What is the most important thing on a smartphone owner's mind? Battery life, of course. After all, the major platforms each have options available that result in longer battery life. These battery savers usually do their job by lowering the screen brightness, turning off certain sensors, shutting off processes running in the background, and more. But someday, battery savers might not be needed. According to a company involved with fuel cells, that day could be just two-years away. British fuel-cell developer Intelligent Energy Holdings is receiving $7.6 million from "an emerging smartphone maker" to help it develop a fuel-cell system small enough to power a smartphone. The battery works by converting hydrogen into electric power, while leaving water vapor in the process. 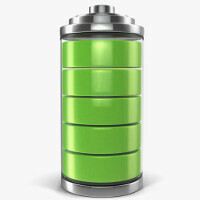 The fuel cell battery for smartphones would be able to last one week between charges. The company is using the money from the unnamed phone producer to develop a prototype and says that such a device is best suited for power scarce areas of the world. Companies like Morgan Stanley and Ikea have turned to the technology to access plentiful energy that is "clean." In London, Intelligent Energy's 'Black Cabs' use fuel cells to transport passengers without leaving harmful emissions in the air. Henri Winand, chief executive of Intelligent Energy, says that this battery could be just two years away from becoming real. "The killer app is a battery with a seven-day refresh life and we think that will appeal to everyone. It’s not just for intrepid explorers," the executive added. With the small drawback of carrying a small hidrogen bomb in your pocket... it does not look like this tech is for everyone to use. You're already carrying a small bomb in your pocket with current lithium battery tech. My dude, you know Google has aquired more companies than Apple right? They even bought Android. Also, who has Apple sued recently other than Samsung? A fuel cell battery wouldn't be splitting any atoms so no it wouldn't be like a hydrogen bomb in your pocket lol. I'm sure safety is at the top of their list of things to achieve while working on these new batteries and don't act like lithium ion and polymer batteries aren't already small bombs in your pocket lol. Neither does a hydrogen bomb, hydrogen bombs fuse atoms. Fuel cells use a controlled chemical reaction to produce electric flow. Ah ok thx for that, I didn't know it fused atoms but I did know fuel cell batteries use chemical reactions to produce energy. This will not help smartphones get 1 weeks worth of battery life. Manufacturers will just make the phones as thin as a piece of glass and will still only last one day. companies and government's give millions to these companies every year. However a lot professorial doesn't expect a true battery overhaul to come till 2020. $7.5 million from an emerging smartphone maker? My guess is it's Oneplus donating the money after the arrogant CEO started trying to give advice to Samsung and talks about their big ambitions.